I’m a bit overwhelmed. 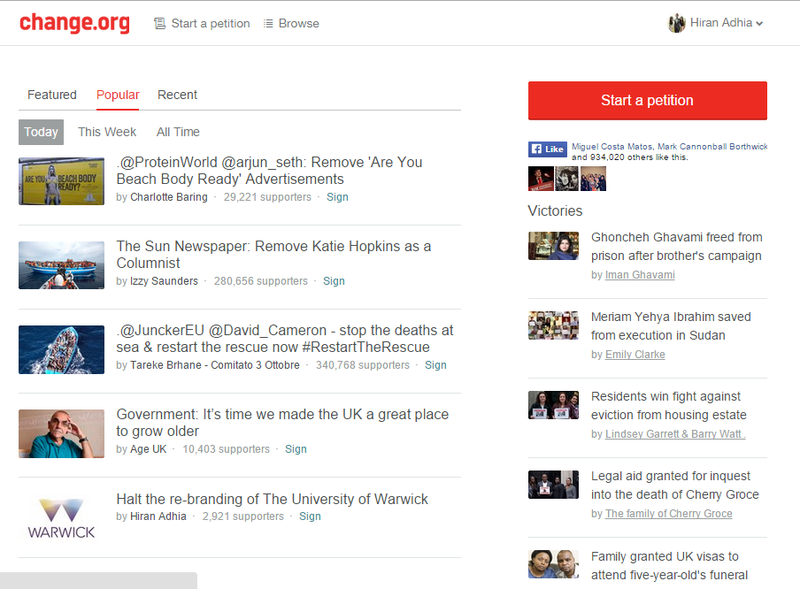 When I decided with some individuals yesterday that we were going to put out a petition, I felt incredibly nervous. Having seen many campaigns like this fail, there was really no telling as to whether people would respond to what we were talking about. However, waking up this morning and seeing almost 1,000 signatures on the list made me realise that I wasn’t alone in thinking that maybe we have done the right thing. We trended 5th on change.org today. A lot of people think it is very trivial. And fair enough to them, but outside of the bubble of essays and exams there is always more going on behind the scenes. I have had more alumni speak to me in the past few days about how worried they are and how thankful they were for a petition where they could really voice their opinions and get behind something. All it takes is a catalyst. One drop of dye in the water to change the colour of everything. No doubt, we have made mistakes. There has been a hell of a lot of feedback and controversy as I was expecting. However, the one thing that I wanted to do, that I felt that the university haven’t been doing, is listening and responding to what people say. We went into the campaign quite headstrong, but after seeing the reactions and listening to some of the intelligent opinions, I think we are closer to finding the right track. And there are organisations that are really listening. The local BBC radio station is due to drop into my house at the cosy time of 7:10 tomorrow morning to interview me for live radio. Nervous doesn’t even come close to it. I have also spoken to a number of national newspapers and student media, as well as members of the Kings College London campaign and we are really garnering support. The one thing that it has shown me is that people care. Even if they make sarcastic comments and jibes in the background, it engages them and they want to know what is going on. There has been a lot of controversy surrounding Warwick this year. And it is a shame that the 50th anniversary of this great institution is in the mire of all of these issues, but there is a way out. I have never been opposed to change, and I think it is actually encouraging, but the processes have to change as well. If the branding of the campus is going to evolve, then so do the people that run it. There should show that students (and staff I might add) will not silently digest whatever they are given by the powers that be. It is as much our brand as it is theirs. So what do you want that brand to stand for? The real window into Warwick that they claim to be pushing is that the student population is a force to be reckoned with. This generation is not going to be ignored. The reason that we are winning all of these accolades is because we are showing other institutions that have been around for hundreds of years that actually we are doing incredibly well. We are competing on the highest platform. This is what the brand should reflect. Us. But if they don’t consult us properly, then this is never going to be possible. Let’s take a moment to reflect and start the conversation again. We need to sit down and start speaking the same http://https://www.change.org/p/halt-the-re-branding-of-the-university-of-warwicklanguage. Like I said before, this is only the start. I am going to carry on from where we left off yesterday. It is easy to ignore the great things that people are doing for others, purely because we are bombarded with so much of it that we start to become used to it. Oh, another person on my news feed is doing a trek or running a marathon, and they are asking for money. Scroll. Nevertheless, I want to share with you the story of how hard it is to raise money. The fundraiser’s story. For the past two years, I have raised over £3,000 with a variety of things, from bake sales to sweepstakes to runs, and am on my way to climb Mt. Kilimanjaro this summer. It has all been for Meningitis Research Foundation and the last thing we did was bucketing on the streets of London this Easter. As much fun as it looks, bucketing has got to be one of the most horrendously difficult things I have ever done in my life. The day starts at 5AM. You collect a permit, put on a costume (in this case a monkey) and you try to beat the morning rush hour. Yes, that’s right. You get there earlier than the earliest commuters, set up a spot and stand in that position for around 4 hours without a break. For the most part, you exhaust your vocal cords telling people about how important the cause is, how many people are struggling and how any spare change can help, over and over again. People don’t care. They avoid eye contact with you, as you smile through the pain of losing the blood in your hands, as the bucket starts to weigh down on your forearm. Your legs ache and toes blister. The bucket keeps getting heavier. With over 12 hours to last, the thought of sitting down makes you want to weep. On the second day at 7AM, a man walked up to me having lost his partner from Meningitis 14 years prior. Initially walking past, he stopped and turned back to face me, his eyes wet with tears. After telling me the story, I put the bucket down and gave him a hug. He started to sob. There were barely 15 people on the streets near Bank Station, yet there we stood, both feeling completely helpless and distraught. He emptied a few coins into the bucket as he went on his way, but he had given me a lot more than his spare change. Suddenly the pain subsided. The aches and tiredness started to disappear. My voice got louder. The smile was back, but this time more determined. I can say hand on heart, that I absolutely hate bucketing. It makes me feel small and basically invisible. However, the right people see me. The ones that have been though the hardship appreciate the effort and that is what makes it count. Luckily, I have no experience or history of Meningitis, but the reason I am so passionate about the cause is because when you meet these people you realise how horrible it is to really suffer. To understand what suffering looks and feels like. Remember that being grateful is about giving back in whichever way you can. Even if you look and feel like a complete fool for 48 hours. To see more about the journey up until this point, click here. And if you are feeling generous, although there is absolutely no obligation to (I can’t stress this enough!) you can donate here. There is possibly three days a year when I don’t see a minus figure in one of my accounts. For any student, the day when your loan drops and a vast sum of money finds its way to you, is usually a day of elation or relief (depending on how far you are into your overdraft…) However, having looked at the figure today, it is clear that I am one of many that does not live within their means. It doesn’t bother me that I am in debt, purely because when I became a student, £27,000 worth of debt hit me like a steam train. Although, this invariably is not an excuse. I even did a free summer course on money management once and found out what APR stood for – if only I could remember now and it might have got me out of this mess. This isn’t going to be a post ranting about tuition fees, but I think it is important to show how such a large amount of debt affects many individuals that are yet to earn their first penny. Ironically, it makes debt less scary. It makes being impoverished a culture. You can go on a night out, or spend an afternoon in Tesco and rack up anything up to 50 or 60 quid and not bat an eyelid because you are covered. And then you completely lose track don’t you? You stop getting the advice slip when you visit the cash machine, because you daren’t look at the amount of money that you are spending that isn’t yours. I actually came to this realisation at the beginning of this year, so this isn’t an epiphany that I am sharing, but an important thought. There is no reason to stop enjoying yourself, nor to a certain extent, splashing out at this point in your life. You don’t have any responsibilities or liabilities and so why not get a dessert when you are out with friends or buy an extra drink? There is no one to stop you. Yet, I think we are better than that. The last three times that my student loan has been deposited, and in fact the last three times I have been paid in the last year, I have made an effort to take a small amount and give it away. Not in an attempt to rid myself of guilt, or to placate the fact that I bought too many takeaways last year, but to realise that even if I don’t understand the value of money yet…there are plenty of people that do who could use it. So the money that I would have spent on a chocolate bar or maybe a sandwich, I spent on a friend’s fundraising effort for a half marathon. In fact, I am going to send her some money as soon as I finish writing this, because I admire the effort she has put in to achieve something and the cause is absolutely brilliant. Check it out here if you are interested. What I am trying to say is that you don’t have to make a grand gesture, you don’t even have to tell people you are doing it (don’t worry, I realise the irony in this, but it is not intentional). As long as you realise how lucky you are, that you can be in the minus and still be living a good life, then it will hit you again…more like a freight train this time. We can complain about being in debt. We can be reckless. However, some people can’t afford that luxury. And it starts with supporting your friends, who will go on to help a stranger, hopefully starting a domino effect. Charity, like happiness, begins inside yourself…but more on this tomorrow. There are better things to do. You have essay deadlines and exams to revise for. This is your future we are talking about. What is the point of listening to tired, predictable suits who are obviously telling the same old lies? The same people that promised you that tuition fees wouldn’t change and then tripled them. Who told you that they would make rents cheaper, and now you are paying astronomical accommodation costs and dealing with untouchable landlords. You won’t vote because you don’t think it makes a difference. When you did a survey online, the policies that matched your views related to that small party, but they won’t win so what is the point in voting for them? It is always going to be the same way, and Russell Brand would have us not vote at all, but that doesn’t stop everyone from talking about this Election. People keep telling you how lucky you are to even have the power to vote, when other human beings fight for this right across the world. Yet you feel powerless. It’s nothing to do with you. Cooped up in the library, reflecting on the stress of the next few months, it is easy to lose the wood for the trees. It is easy to start thinking about how difficult these exams are going to be, or what the hell you are going to do once you get out of this place, but it is more difficult to make a decision. A choice about where you want this country to go. You can’t really see it yet. How it is going to affect you in the long run. We are conditioned to think 10 weeks at a time, to take less of an interest in what is going on outside of our bubble and to forget that the decisions made in that antiquated chamber with the green seats has an impact on you. That is what politicians want you to think, because silencing your ballot is easier than being accountable. They don’t want you to vote. So you won’t. No one in government advertised for registrations, because they are happy ignoring you completely. They’d rather make empty promises like cutting tuition fees, than actually listen to what you have to say. They will even come to your campus, but won’t invite you to attend, because it’s better to keep you out, than to let you in. They are scared. And they should be afraid. We are the most successful and aspirational generation for decades, with the opportunity to shake the foundations of Westminster and swing an Election. You only get this chance once every five years, so don’t waste it. Prove them wrong. Vote. This is the season of slumping. The time when most students hibernate into their rooms to stare at the artificial glow of their laptops as the first rays of Spring make concentration impossible. When punch cards for coffee are used vigorously in library cafes and books start to pile on empty desks one by one. This is the time when a year’s worth of learning is condensed into a month’s understanding and a week’s application. And here I lie, books firmly closed, writing another letter to you. I feel invigorated. As the passion of writing and reading courses through every sinew of my being again, I can proudly announce that I am no exam machine. Although I will have to furiously write four essays in three hours and repeat this process three more times, the biro digging into my middle finger will not bother me. I will look at it as an opportunity to progress, to push myself further than I thought I would have to. I will approach things in a different way, actually believing that failure is a stepping stone to success rather than secretly thinking this is what inadequate people tell themselves to feel better. I will remember what is important. The things that I have seen and experienced taking the first steps on my own, the mistakes I have made thinking that I knew it all. The people I put faith in who came through, and the ones who promised the world but delivered little more than excuses. And the ones who put their hands on my shoulder when I least expected them to. And the hands that lifted me up that I didn’t even recognise. I am writing again and it feels fantastic. I don’t feel bottled up or stored away which can happen when you repress an expressive instinct. I do not feel caged or restricted or stopped by anything or anyone other than myself which is the perfect place to be. I feel like my head is clearer than it once was and all the doubts of impression have slowly subsided as each day has painted a bigger smile across my face. I can let the words flow, the metaphors drop and realise that I am at the peak of my being. It doesn’t even have to make sense, and it probably doesn’t, but strong emotions rarely do. This is just the beginning. I have a cause and a direction. I am not bogged down in details, nor am I lost in the translation of the bigger picture. While everyone is questioning themselves, I am starting to find the answers. I have stopped running in circles and started to walk towards a path that will lead me to gratification. The speed of my fingers cannot keep up with the ideas that are pedalling back and forward in that brain of mine. So I will write them here. And I will make time to make them grow. Luckily, I have never come into to contact with meningitis or septicaemia. They are both afflictions that have a dramatic impact on someone’s life and I feel so fortunate that neither I nor a loved one have been affected by it. However, I remember at school being given lessons on how to recognise it, the headaches and loss of vision, paralysis and sense of numbness. Knowing this as well as the fact that you are more susceptible to it when you are young, as I got older I neglected to understand it any further. All I can vividly remember now is that if you got it, you had a very short time to live, and the chances are you couldn’t treat it. It was and still is extremely frightening. So I started to look into it. I wanted to read the stories of those that had been blighted and it is my mission to share some of these stories with you. Of individuals that have fought it. Some have won these battles, and some have sadly lost them, but all of them are important in their own right. I thought I would start with one that really affected me when I read it because…well you will see why when I tell you. Kathleen. She was a university student just like me and walked into her first year as a fresher full of enthusiasm as the next stage of her life began. She was a dancer and had performed since she was very young. Having come back from rehearsals and gone to bed early, her life was about to be inextricably changed in just one night. She had somehow contracted meningococcal septicaemia. I will go into detail of what this consists of in a later post. Luckily, she was able to drag herself out of bed and find her flatmates – feeling delirious and disorientated, within an hour she was at hospital. Within hours, her organs started to shut down and she was taken into intensive care. Her parents had got the call that their daughter was hours away from dying. The only thing that was saving her heart was the fact that she was fit due to her dancing. But unfortunately, Kathleen would never dance again. After surviving those first few hours, and spending over three weeks in hospital including Christmas Day and New Year’s, her legs had severely deteriorated. She said, “Being told I would lose my legs is still the hardest moment I have encountered. The loss of my limbs, the empty space on the bed where my legs once were, is still emotionally painful to me. I would never dance again.” When I read that sentence, I teared up. I can’t imagine giving up my passion, it would be like my hands being chopped off so I couldn’t write. When I read that sentence, I realised how important it is to share Kathleen’s story. Charity is a faceless cause. It is surrounded by aggressive advertising, cheap benefits and the same logos and branding. It is a business and I would be naïve in suggesting that it isn’t. However, there is a human side behind the money that is vital in highlighting. You need to see the change that you are helping to create, otherwise I can understand the cynicism. But be brave. Donate some money, but more than that give your time to a cause that you believe in. And tell me about it, because I live to hear your stories and write about them. What is life without anecdotes and lessons?